hello from rome! i’m in a hotel room right now and should totally be sleeping because my babies are (I WILL REGRET THIS IN A FEW HOURS), but i also allowed myself to drink bunch of cokes today (did you know i gave up soda on january 1st?! i don’t think i blogged about it so maybe not. but besides drinking one on josh’s birthday on the 31st, i’ve waited until our trip to italy to allow myself to drink it again. i hope to quit it once more when we’re back in new york because my soda habit was getting outta hand and i felt like a drastic stop was the only way.) anyway, not the point here at all with this blog post, BUT i am hyped up on caffeine at the moment, so here i am! awake! GETTING STUFF DONE! i have a lot i am excited to share, but i was only able to get to some photos from the colosseum tonight, so here they are! also, a side note, but i found this mission ROME book for the kids before we left and it has been such a fun activity book for them to do together as we’ve checked out some of the museums and sites so far. it is jam packed with history and fun facts and has this scoring system as they discover and explore the landmarks of rome. my kids are all about pretending to be spies with code names daily, so it has been perfect. ps. 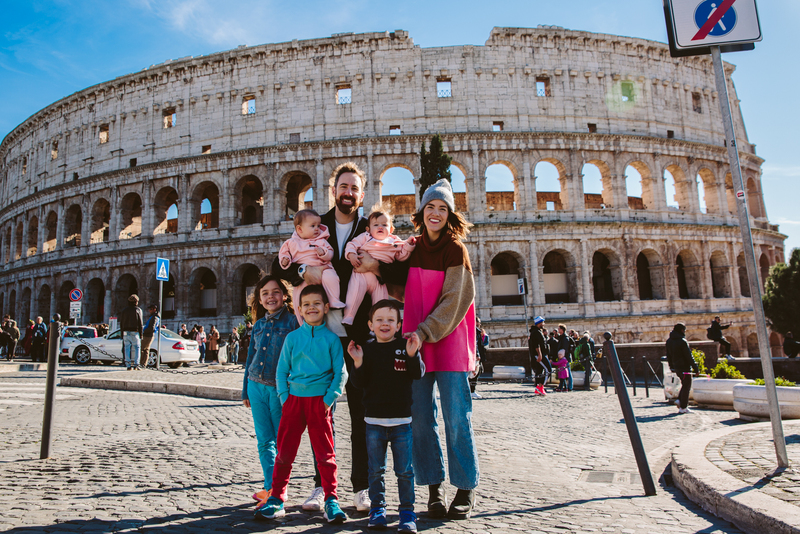 a blog post from with pics of eleanor and samson and josh outside the colosseum back when they were babies and our only two! one kid jumping, one kid about to karate chop me, and one kid doing the floss! the fact that i got a photo of all three looking in the photo above this one is MAGIC! the mission ROME book i mentioned above. seriously throw backs to these photos from 2012! more to come! i’m doing more insta stories (videos) these days since it feels easier with my arms full of babies, so feel free to check them out over there in the meantime if you’d like! 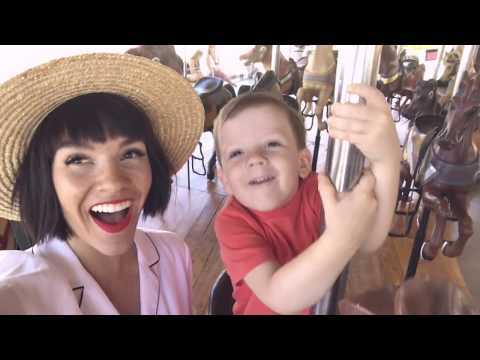 and for those who might be new to this blog of mine and have inquired about family travel, here are a few blog posts i’ve put together around the topic that i hope you find helpful! still figuring it all out as we go each trip, but a lot of things we have found most useful i have made sure to make a note of below. feel free to ask any follow up q’s in the comments below as well. — tips for finding cheap airline tickets for family travel. 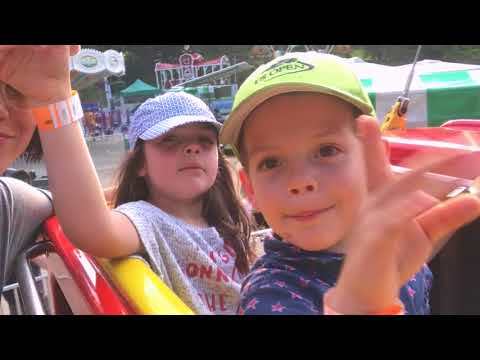 — our tips and tricks for traveling with children and also traveling abroad with children! –and tips for packing with kids! —-WEARING: this color block PINK SWEATER, these JEANS and these BOOTS. Hi, I am a grandmother from the Netherlands. Have 5 grandchildren and I only discovered you via instagram. Now I am reading your blog and enjoying it immensely. I think you lead a great colorful life and I think it is wonderful that you enjoy life so much and have fun with each other. I still have a lot to catch up on the blog and Youtube area. But I already enjoy it a lot. Beautiful! Have fun and enjoy the (hopefully) nice weather. I’d be so interested in a kids/baby clothing post. I love how they’re always in colorful clothes and would love ideas for my baby boy. Thanks! How do you travel through the school year with school aged kids? Thanks for sharing your travels with us! It’s motivating. I see you enjoy Rome and how cool you gave up soda for such a long time! How fun! And thank you for sharing! We moved to Thailand almost two years ago. I needed a new work environment and wanted to expose my kids to new places. About every two months we get to take a trip. It has been awesome to see so many countries. I feel so fortunate to get this opportunity in my life right now. My kids might not always agree but they have been the best travel buddies a mom could ask for! I hope you all adjust to the time and enjoy Rome! And the temple. I can’t wait for the temple to be built here in Thailand and it was announced almost six years ago. They just broke the ground about two weeks ago! Love Rome and your pictures! what camera and lenses did you bring on this trip? So fun! We did those kids spy mission books in Paris and London. My two boys loved finding all the missions. Plus we adults learned stuff and saw things we wouldn’t have know to look for. When we got home they got certificates of completion of their spy mission. Now when we go to a new country they expect to have missions to complete so they can stay spies! Have fun! Italy is next on our list. Plus our family is from Italy! Hope you have a great time in Italy! Your kids are ADORABLE! I can hear you choosing joy despite your mom exhaustion. You are a rockstar! Happy Valentine’s day. I’m sure your day will be filled with kissing that family of yous. I have to say it is so good to see all of you on this trip (or any of them really)! I feel like we get paralyzed by all the what-ifs of how hard or difficult things can or could be (and they are) but then we just do it anyway and the memories of the good are what last! If you have the resources to travel it is such an amazing experience for our babes, even if they don’t have direct memories of it, it still helps them grow into the great people! you guys are epic. have a great trip! Look at such a family about the ruins in the sunshine! It is sorry your luggage was lost and you had to borrow la blusa and pantaloni but hope that soon the airline will find and bring your bags! Have you tasted a affettato cappuccino yet? Maybe not so good for bambini and madre che allatta but sweetie can drink and kiss you so you get taste! Hope sweet family has polite time on visit. Salutammo ! So cute! What special memories for your kiddos! Nice photos and nice trip!! we love Rome and the gelatos! We are headed there as a family of 6 this summer! Where are you staying there? Looking for a family friendly place to stay for a couple days in Rome. Thanks! Will you do another post on the gelato place? I sent one of your instastories to my sis in law, we are going to Rome in March. So we could remember to go to the gelato place (looked amazing) But now it’s gone, they’re only temporary. I can’t remember the name. Thank You!!! Love all the pictures! have fun! I think Rome is my favorite city in the world. Thanks for sharing!! Looks like an amazing trip. you are brave to take that many kids with you!! I dont know how you manage to capture such beautiful photos with your whole family! Blowing my mind, always. i can barely do it with two kids! This looks like such a fantastic time!! I used to get so jealous reading travel blogs…I used to travel so much before kids, then had three kids (twins are in that grouping). But your traveling with kids has inspired me so much to realize that ITS OK! You can travel and have kids and I don’t need to be jealous ;) I love your writing style, your photos and your positivity. Plus I’m addicted to coffee and go through diet coke addiction phases, so you are not alone! Agreed..could you share your hotel? Did you stay at the same hotel for the entire vacation? Going soon…can’t wait! Thanks for sharing! Hi there! Travel question: it looks like you tend to opt for hotels often over vacation rentals. Is there a reason that you chose hotel stay, specifically for your most recent trip to Italy? We are going to Italy in two weeks and I’m finally booking our lodging, trying to decide between the two options and always look to you for travel tips. Love to hear your perspective if you have the time. Thanks! We have done both and find pros and cons with each. We look at both options, then decide. That’s what I would recommend. A lot of the time, the place you visit and your itinerary will help decide which to choose. Otherwise, a combination of availability, price, and amenities will influence your decision – if that makes sense. In Italy, we stayed in a hotel in Rome for several nights and in an apartment in Florence for a longer stay…then a hotel for 1 night in Parma, a hotel for just 1 night in Florence that was across the street from the train station, and a hotel for just 1 night at the Rome airport before we caught an early morning flight. So it just depends! Specifically for traveling far away across several time zones with young kids like you will be in a couple weeks when you go to Italy, it can be helpful to go straight to a hotel with a fast and early check-in and no surprises for you when you show up with kids sleeping in your arms.